The Assembler species is rare and elusive; only one specimen, Kud'ar Mub'at, is known to have ventured off its homeworld. In mandalorian armor, Kud'ar Mub'at and Prince Xizor use the famous bounty hunter Boba Fett in a plot to destroy the Bounty Hunter Guild. 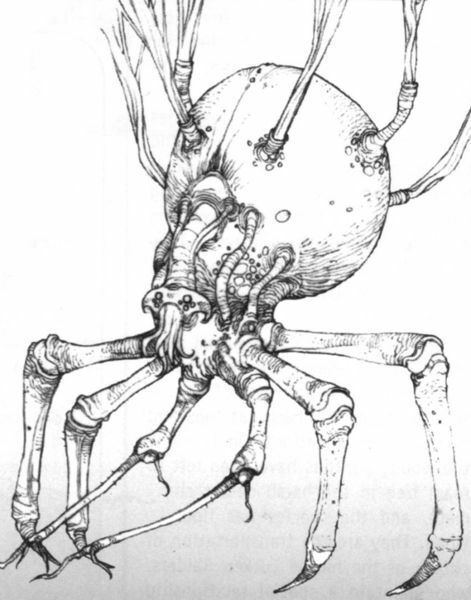 The main Assembler form is a large arachnid creature that is mentally linked to smaller versions of itself. Each "node", as the mini-Assemblers are called, is delegated a specific task. For instance, "lookouts" act as surveillance cameras, and "pilots" navigate the immense cocoon that an Assembler constructs so that it and its nodes can survive in space. Each node is intelligent, and capable of growing up to become a full Assembler. The main Assembler must therefore be wary enough to kill the nodes before they become mature enough to arrange the Assembler's demise directly or indirectly, thereby taking its place. However, since nodes become more useful as they mature and grow, the main Assembler always face a dilemma as to when to kill its nodes. It seems probable that this trait is somehow beneficial to the population as a whole, possibly because it ensures that an Assembler is crafty and clever; it would not have become an Assembler or remained an Assembler for long if it were not. Kud'ar Mub'at was a node himself and killed his parent in a time "long before Boba Fett was the most feared bounty hunter in the galaxy". Kud'ar Mub'at was, in turn, overthrown and killed by the node known as Balancesheet.